ACT Fibernet, India’s largest non-telco and 3rd largest Internet Service Provider has announced the launch of 1Gbps (Giga speeds) wired broadband internet service for the city of Hyderabad. Launched in the presence of K. Taraka Rama Rao, Minister for IT, Municipal Administration and Urban Development and Industries (MAUD), ACT Fibernet is the first player in the Indian internet market to GIGA enable an entire Indian city. When the average internet speeds in India is 2.5 Mbps, ACT Fibernet’s 1 Gbps launch will leapfrog Hyderabad internet speeds to 400x national average. Very few cities across the world can boast as being ‘Giga enabled’, certainly not at this scale. This launch places Hyderabad in league of select cities in the world that can boast of such futuristic technology. Giga speeds will allow downloads from the internet faster than transferring data from a USB drive. ACT Fibernet is the largest broadband provider in twin cities of Hyderabad and Secunderabad with over 65% market share. 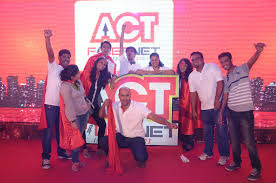 Growing at an incredible rate, ACT Fibernet is known to be a speed pioneer in the broadband industry; this launch will not only provide internet connections at incredibly high speeds, but will disrupt and lead technological growth in the country. Malladi further added, “We are confident this product will transform the way internet is now being consumed at large and this will fast track the government’s newest target to connect all its 23 million Telangana residents through the Internet by 2018”. India is the second largest market globally with internet connectivity reaching over 400 million people. With the government’s constant and fervent efforts to internet enable cities, internet penetration is set to reach over 600 million users by 2020. Additionally, the government’s recent announcement to boost high-speed broadband via optic Fiber to 1,50,000 gram Panchayats will further receive support through initiatives such as ACT Fibernet’s and its contribution to the country’s digital growth. ACT Fibernet’s 1 Gbps wired internet service is slated to soon be available in the 11 cities the company has presence in. The product is currently available in Hyderabad for Rs 5999 per month, 1 Gbps , 1TB FUP.